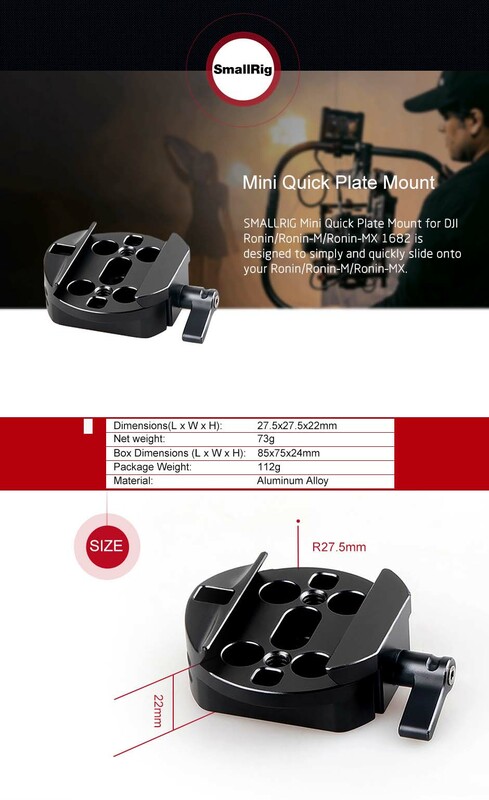 SMALLRIG Mini Quick Plate Mount for DJI Ronin/Ronin-M/Ronin-MX 1682 is designed to simply and quickly slide onto your Ronin/Ronin-M/Ronin-MX. It offers two 1/4" -20 threads, two M5 holes and four 1/4’’ countersinks, which allow to attach other accessories, such as SMALLRIG Ronin-M/Ronin-MX Handheld to Tripod Adapter 1689. This mount features two anti-release holes that makes no direction restriction to install it to Ronin stabilizer. With this quick plate mount, you are able to quickly switch your camera from Ronin, Ronin-M or Ronin-MX to a tripod. It fits my Ronin-M very well, I like the nice design. The quality is very good, fast delivery, love it.